The last time the DS crew got together was one of the best Hip Hop shows to bless Los Angeles in a long time. With appearances by Fashawn, Aloe black, Blu , Exile, Choosey , Dag Savage, Dilated Peoples, Dom Kennedy, Everlast of House Of Pain, and the Goat himself, Nas came out to truly make this a memorable moment. Shout out to Mass Appeal! 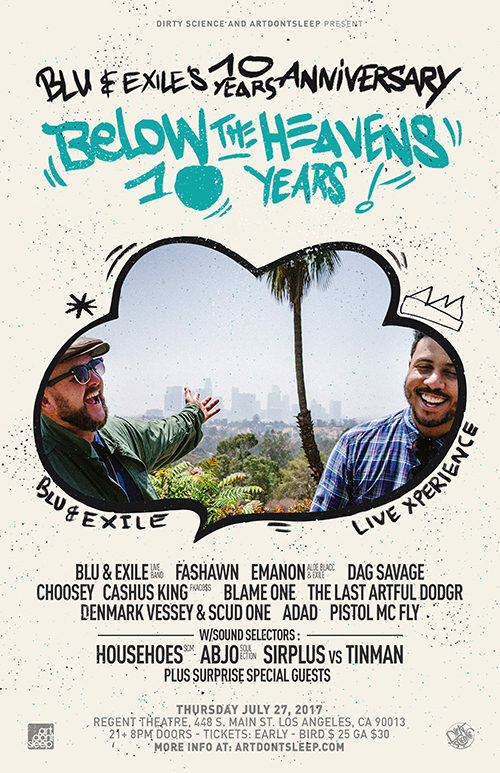 Once again Art Don’t Sleep and Dirty Science is bringing you yet another future classic event in celebration of one of Hip Hop’s most classic albums, Blu and Exiles: Below the Heavens, in it’s entirety with a live band!